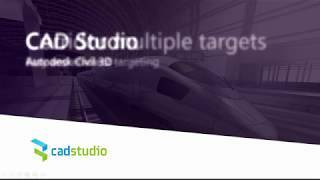 Corridor multiple targets (CMT) is an add-in tool for Autodesk® Civil 3D® 2018, 2019 and higher. It simplifies targeting of complex corridors using text filters and using entity selection directly in the model space. You don't need to switch between object types when targeting to an alignment, feature line or line. You can easily setup multiple parameters for different regions, subassemblies and even baselines. A plain dialog box completely replaces the standard Civil 3D dialog and simplifies it substantially. The dialog is floating (non-modal), so you can freely move in model space when setting targets, no need to close the dialog. In this way, you can easily watch the results of your design work. What are the main benefits of CMT? Very good replacement of Civil3D targeting dialogs. Testing just the trial version.